Support wavTones by unlocking additional features! Generating and downloading uncompressed sound files takes up comprehensive server resources. Purchasing a license helps keep the server running on our side while unlocking additional features on yours! Already registered? Retrieve your activation link here. Why do our test tones sound better? Generating waveforms properly is not as easy as it seems. 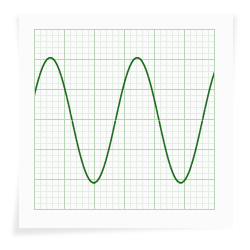 Any periodic signal with a discontinuity in its waveform (such as a square or a sawtooth) or a discontinuity in its waveform slope (such as the triangle wave) will be characterized by an infinite spectrum. Simple methods of digitally generating these waveforms will perform poorly, as frequencies higher than half the sampling rate will inevitably fold back into the audible spectrum. This phenomenon is known as aliasing. Aliasing occurs even in the simplest of cases. The figure on the left shows what happens when the Digital-to-Analog (DA) converter receives a basic sequence such as a square waveform. The samples are perfectly aligned and the transition is sample-sharp. However, the reconstructed waveform is not what it seems. Among the various interconnecting possibilities for our samples, the DA converter will only reconstruct a waveform whose spectrum is limited to half the sample rate. Because the analog square waveform has frequencies extending to infinity, it cannot be a reconstructed waveform. The reconstructed waveform doesn't look square and its frequency content doesn't sound "square" either. The upper frequencies are missing and - even worse - new frequencies have been added! These frequencies arise from the particular shape and slope of the vertical transition, which depend on the actual sample rate. Our tone generators have been designed to minimize those unwanted frequencies. When we generate a square tone, we synthesize a waveform that has been designed to sound as close as possible to the square tone, not the square waveform itself. Our samples are no longer aligned and the transition is smoothed so additional frequencies are not introduced. The result of this process is illustrated in the figure shown on the left side of this paragraph. Our waveforms may look worse, but they actually sound better! A perfect square waveform supposedly only consists of odd harmonics. 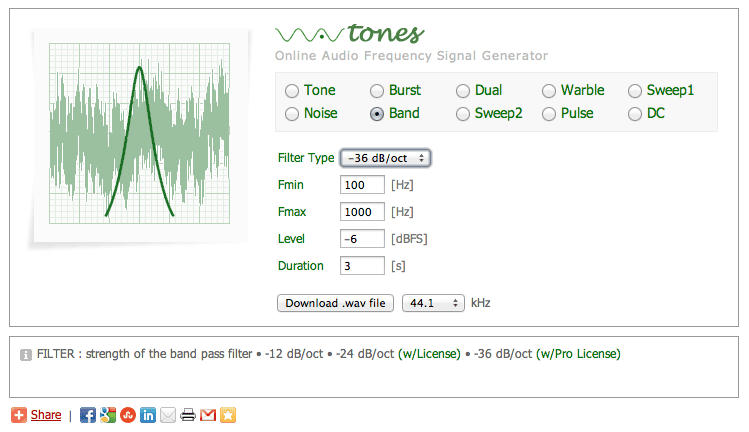 How does the output of our tone generator compare to other frequency generators? Take a look at the various spectrum views here and draw your own conclusions. Download these original samples taken from various sources, take a careful listen and let your ears be the judge! Internally, our custom algorithm uses 32-bit alias-free variable-length wavetables combined with audiophile-grade interpolation. Our noise generators are stochastic, not sample-based. Also known as a 'function generator' or 'waveform generator', a signal generator delivers accurately calibrated output with adjustable frequency and amplitude. Our wavTones signal generators have been optimized for use in audio and acoustics applications. These specialized signal generators are often referred to as a 'tone generators' or 'sound generators'. Audio plug-ins for web browsers are known to be prone to sample rate conversion artifacts, preventing the use of inline playback for professional sound applications. Our test tones have been made available as .wav file downloads exclusively, ensuring uncompromising sound quality. This website is designed and maintained by Dr. Ir. Stéphane Pigeon.